Public money has been helping finance the Kosovo film industry for over ten years, but opportunities for Kosovars to see the films they have helped produce remain limited. Since 2016, the Municipality of Viti has had a 3D cinema, thanks to a project supported by the European Union. But the cinema, which cost 87,000 euros, only rarely shows films. Its last screening was in August 2018. Up until April 2019, there have been only 23 films shown at Kino 3D: 10 documentaries, 6 feature films, 2 international feature films, and 5 short children’s films. With the exception of the two international films, all of the other films were screened in collaboration with the Kosovo Cinematography Center, KCC. Through the KCC, the Kosovo taxpayer has partially funded 154 film projects over the last ten years, but these films are currently lacking cinemas in which to be screened, and opportunities to see the films are rare. It is a state of affairs that director Ben Apolloni believes is problematic. “Unfortunately, the Kosovar audience is deprived of the chance to watch these films, even though they pay for them to be produced,” he tells BIRN. According to the director, it is the failure of the KCC that these movies aren’t presented widely enough to the Kosovar audience. “The KCC has to change, to work harder, and be more creative,” he says. The KCC was created after the adoption of the Law on Cinematography in 2004, but the institution only started functioning in 2008. It has supported 154 film projects in different categories over the last ten years: feature films, short films, documentaries, animations, script development, as well as debutant feature films. In 2018 alone, the KCC supported 27 film projects with 1,179,400 euros of public funds (a total which doesn’t include a project with the working title of “Hotline,” for which there is missing data on the amount of financing it received). The project that received the largest amount of financial support last year was “Searching for Venera”, which received 200,000 euros, while the lowest amount granted was 5,000 euros, mainly in the script development category. In return for financially supporting a film, the KCC is entitled to customize the production, and is responsible for the distribution and presentation of the films around the country. 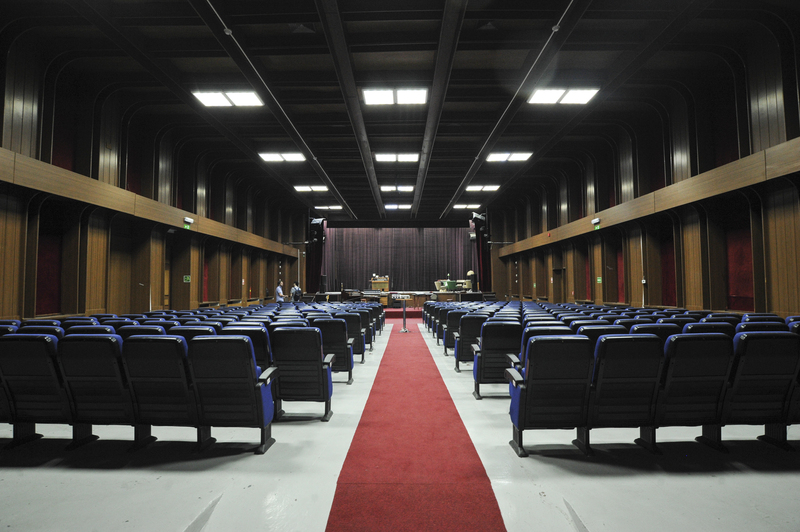 Kino Jusuf Gervalla in Peja. | Photo: Atdhe Mulla. Apolloni, who received a grant to make a short film called “Umbrella” last year, believes that the KCC should not ignore the Kosovar audience, and should be engaging with audiences in all municipalities. “How can I talk about the film industry when there are no conditions to produce more films and present them in Kosovo’s cinemas? It should be clear that there is no industry without both production and distribution,” says the director, who believes that the lack of cinemas are a failure of both the KCC and the Ministry of Culture, Youth and Sport. 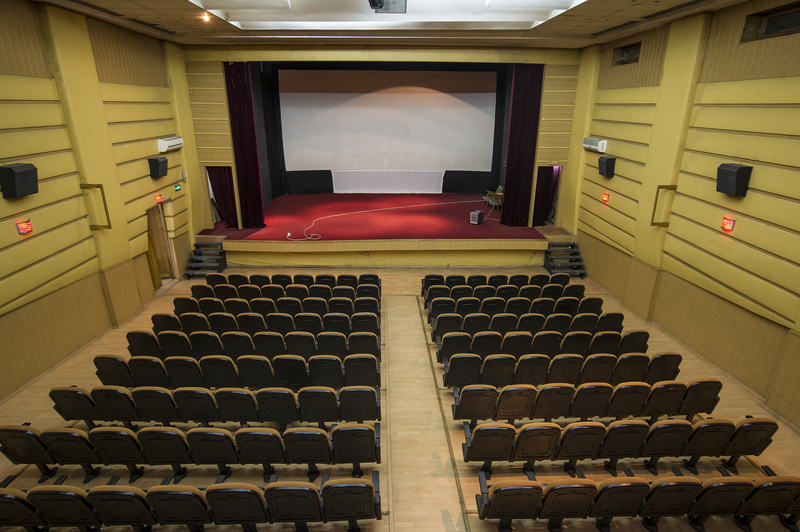 However, after the privatization process in Kosovo, cinemas in both Ferizaj and Gjilan no longer function as such. The building where the cinema in Ferizaj was situated has been destroyed and replaced by a property housing residential and commercial outlets. Zharku has admitted that the KCC had the power to save the cinemas from privatization but did not use it. 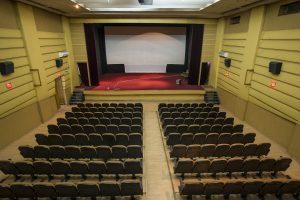 Up until the 1990s, there were cinemas regularly screening films across Kosovo, including in Prishtina, Prizren, Mitrovica, Fushe Kosove, Gjilan, Peja, and Ferizaj. Now, the only cinemas that screen films regularly are Kino ABC, Kino Armata and Cineplexx, all in Prishtina, though there are other cinemas with irregularly scheduled programming, including Kino Lumbardhi in Prizren, Kino Jusuf Gervalla in Peja, and Kino 3D in Viti. Kino Armata. Photo: Atdhe Mulla. In terms of viewing figures, Alush Gashi from Kino Armata says that 20 local movies have been screened at the cinema, with 12 of them short films and 7 documentary films. These movies were watched by a total of around 2,000 viewers. Defrim Puka from Cineplexx meanwhile, says that since opening, the cinema has shown 6 local films, watched by a total of 30,000 viewers. BIRN made enquiries regarding viewing figures at Kino ABC but received no response. Zharku argues that despite the lack of cinemas, the Kosovar audience is able watch local movies through the country’s film festivals. Since the end of the war, there have been five major film festivals running in Kosovo: DokuFest in Prizren, PRIFEST in Prishtina, Anibar in Peja, FerFilm in Ferizaj, and Hyjnesha ne Fron which has taken place in different cities, but since its seventh edition in 2009 has been held at the railway station in Fushe Kosove. BIRN asked the KCC if there are records on the number of films it has subsidized that were presented at local film festivals, but received no response. However, from BIRN’s investigations, it seems that the appearance of films financed by the KCC at Kosovo’s festivals was often limited. Sabri Pajaziti from FerFilm says that only 3 local feature films were presented at the festival over the last seven years. “FerFilm is an international short film festival. We don’t invite entrants, the movies enter themselves. A feature film is presented only on the first night, out of the competition,” Pajaziti says, explaining the ethos of the festival. Avni Shkodra, the Director of the Center for Contemporary Art, says that films have to be presented through other mediums, not only in cinemas. Recently, the KCC have also recently started presenting publicly funded Kosovar films on Gjirafa, the online platform. In 2018, the first year of this collaboration, 10 local films were posted on Gjirafa, with the films generating around 200,000 views. In addition, there were three other local films made available on the platform due to direct agreements with their producers. As well as exploring alternative environments for film screenings such as parks, theatres and schools, Zharku said that the KCC have offered the same cooperation that exists with the Municipality of Viti to municipalities in Kacanik and Bujanovac, in southern Serbia. “We will go to different cities, gather expertise, report and explain what is needed in order to make a cinema functional,” he says. According to Zharku, the KCC’s budget for this year totals 1.4 million euros, the same as last year, when roughly 1.2 million euros was used to fund local films. It’s a big increase from 2017, when the KCC had a budget of 800,000 euros, with 700,000 being spent on funding for films (details on budgets from before this point were not revealed by the KCC). For Apolloni, the only good news until now is that the KCC’s budget has increased. Even though he calls the budget for the past two years “solid,” the director believes that this is not enough, and that there has to be further changes. The director believes there is a need for deep reforms in the way films are supported in Kosovo, because film producers are currently encouraged to become deceptive. “KCC regulations and the Law on Cinematography force the artists to become liars,” Apolloni says, referring to the fact that the maximum amount that the KCC can subsidize a film project for is 51 percent of its total budget. According to Apolloni, Kosovar producers find it impossible to fill the financial gap for the other 49 percent. “The maximum budget that Kosovar artists can find is 70 percent, after that they have to become liars and do anything to reach the necessary quotas [on paper], just to gain the right to shoot the film and then to finish it,” he says. Zharku explains that the KCC receives daily reports about a film’s budget as soon as shooting starts, and that they have also created “budget ceilings,” where the maximum that a director can get paid is 14,000 euros, a figure based on the “local market.” BIRN asked the KCC if they have mechanisms to prove the total budget of the films, but they did not respond. Filmmakers have often criticized the Law on Cinematography, and there have been requests for amending and supplementing the law. In 2016, the Draft Law on Cinematography was withdrawn when it was rejected by the KCC, the Kosovo Producers Association and other artists who claimed the draft law would prevent the development of cinematography in Kosovo. The draft law was not approved and no efforts to change the law have happened since. Amid disagreements about the Law on Cinematography, the limitation on filmmakers, and the absence of cinematic infrastructure, Kosovo’s public cultural institutions have further work to do to make films that have been produced through public money both finalized, and accessible for the Kosovar audience to see. This publication has been produced with the assistance of the European Union. The contents of this publication are the sole responsibility of Ngadhnjim Avdyli and can in no way be taken to reflect the views of the European Union or BIRN and AJK.